The Amazing Race 23 is starting up on February 23rd, and this will be the third season with returning racers. In fact, three teams are returning for their third race! The idea is that these are “All-Stars”, although none of these teams have won it all. In fact, I wouldn’t classify these teams universally as popular, but they are, indeed, some of the most memorable teams to have raced in recent seasons. All of these teams have a prior track record, but they are also in demographics that provide some insights on how they might perform relative to other demographics. So let’s make a go at predicting the finish order of this group of racers. This is a very inexact effort, using some small-number stats, and the TAR Producers have done the usual job of creating an evenly competitive group. Using the basic demographic information available and the 22 prior seasons of 2-person team racing, let’s see what the stats say. I examined the TAR 24 teams based on their age, relationship, and gender, and analyzed two things to come up with pre-season rankings: First, I ranked them by how frequently a team of their composition made it to the eleventh leg of the race, typically the final four. Making it to leg 11 indicates a deep run into the race and is a good indicator of success. 34% of all teams meet this bar. So if a demographic makes it to leg 11 more than 34% of the time, they beat the average. Second, if there is a tie in the average percentage to leg 11, I look at the average finish of that demographic. As a third tiebreaker, I take into account the prior finish of the teams participating. David and Connor were heroic the last time they raced. David, the father, ruptured his Achilles tendon in the first leg, then the team kept racing with David on crutches. Even in this hobbled state, this intrepid father/son team actually got two first place finishes (one of them aided by an Express Pass given to them), before they had to bow out in 8th place overall and get David into surgery. Even with this prior success, the demographics don’t look good for David and Connor. No intergenerational team has won it all, and no father/son team has even made it to Leg 11. If there is a team who can buck the odds, it’s these guys, who stay very fit and clearly race well together. Mark and Bopper bring lots of positivity and personality to the race, and we all want to see them do well. They performed very well, actually doing the second best of teams in this demographic with a 5th place finish. Art and JJ, the Border Control agents from Season 20 were the only ones to exceed them with a second place finish. I’m not sure if Mark and Bopper have the strength and stamina to win it all, but we do want to see them stay in the race as long as possible. Go Team Kentucky! Natalie and Nadiya, who were most memorable for being loud the first time through, made it to a 4th place finish in their prior effort. 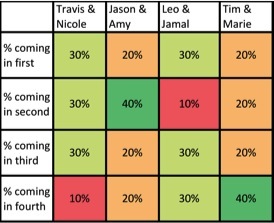 It should be noted in the last “All-Star” edition of the Amazing Race, siblings LaKisha and Jen won it all, so perhaps there is precedent that the “twinnies” can pull ahead of the competition. Unfortunately, overall, sisters teams haven’t lit up the scoreboard on the whole, leaving these twins with a pre-season rank of 9. Rachel was a study in emotional breakdowns the last time she raced. Nonetheless, they kept it together as a team to make it to a 3rd place finish. Rachel and Brendon were engaged at the time of their prior race and now they are married, putting them in a new demographic. The exemplars from this group were Dave and Rachel, who dominated the Season 20 competition to a first place finish. I don’t see the same overall capability in Brendon and Rachel. However, Rachel has won Big Brother, so perhaps she can bring that competitive ability and take down the competition? Expect another head-shaving challenge to test this. Joey and Meghan finish fifth the last time they raced, but they didn’t really light up the scoreboard while racing. They always seemed to be somewhere between 4th and 6th place. They are perhaps a little more worldly than their first time through, and the prior experience will help them, but the competition will be that much tougher. Can these YouTube hosts manage to break out of the pack? Margie and Luke have competed twice before, garnering 8th place and 3rd place finishes. As stated above, no intergenerational team has won The Amazing Race, but given their experience this could be a possibility. Margie has always proven to be one of the most capable all-around racers, so if there is the right mix of challenges and Luke steps it up, who knows? Caroline and Jen were a lot like Joey and Meghan when they raced. They always finished toward the middle, and never toward the top, eventually leaving the race in 4th place overall. There are now in the demographic that Nat and Kat were in when they won it all, so don’t count these country singers out. An Express Pass here, a Fast Forward there, and they could make a deep run. Flight Time and Big Easy have a great track record – a fourth place finish, in which they were thwarted by the Kafka challenge in Season 15 and then a strong second place finish in the Season 18 All-Star edition. Unless the TAR Producers bring back the Kafka challenge, these guys have what it takes to win it all. Heterosexual dating couples under 30 are consistently high performers. John and Jessica were on track to contributing to that success the first time they raced, with a first leg win and an Express Pass in hand. Then John’s overconfidence prevented them from using the Express Pass, and they were summarily eliminated very early in their season. We can expect that John and Jessica will be more aware of where they stand in relation to the competition this time, and I expect that they will be motivated to show they can finish higher than 9th. The self-proclaimed “Afghanimals” had lots of energy when they competed just last season, eventually coming in 4th. If they can bring back that same energy, they will, indeed, be one of the top teams. They are battle-tested, and the back-to-back racing means that they are probably on top of their game. Few teams in the group can out-run these guys, so if they can race mistake-free, they should be considered one of the favorites. “Oh My Gravy,” Jet and Cord are the team to beat. This is their third try after 2nd place and 6th place finishes. These guys are full-time athletes, they are used to being on the road, they’ve seen all of the challenges the TAR Producers know how to throw at them, and they are charming. They are easy to root for. And they are good. The way these guys can be eliminated is via U-Turns, but who would have the heart to U-Turn these fun-loving cowboys? As stated above, these predictions are sure not to come true, but I have three predictions that will: The TAR producers will dress the teams up in extra ridiculous costumes, the challenges will be a bit harder and Phil will arch his eyebrow extra high. We’re looking forward to Season 24 of TAR! 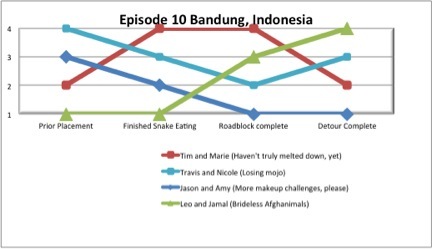 Keep reading the Amazing Race Analysis blog for more analysis! Tags: Analysis, Picks, The Amazing Race All-Stars 24, Who will win? Another exciting episode of The Amazing Race! This week the teams stayed in Bandung, Indonesia, where the TAR producers brought in the one-a-season eating challenge, where each racer had to eat a portion of cobra. Much was made of the strangeness of eating cobra, but it looked like a reasonably sized portion, and it appeared to be deep fried, so it probably had some nice crispiness to it. The racers overall gave the cobra a bad review, but this was much better than when Charla from season 5 had to eat a kilogram of caviar. Now that looked tough! I say good job to the TAR Producers in making the eating challenge more about food found in the local area and less about challenging one’s ability to eat large quantities. The “Boil an Egg” Road Block was an interesting twist – rather than trying to do something as fast as possible, the challenge was to be patient enough to do something thoroughly rather than rush it. This proved to be more “devilish” than thought, as three of the four teams didn’t do it right the first time around. The Detour had a great risk/reward component – either search a field for a pair of shears, which could be done quickly or very, very slowly, or apply Indonesian bride make up to both team members, which would be done very slowly, but steadily. Leo and Jamal started the leg in first, but this is the first leg they have raced without their allies, Ally and Ashley, whom they consistently refer to as their “race brides.” The leg started well enough, as they got some protein with the snake, but it got interesting once they got to the egg-boiling challenge. While Travis and Jason tried to cut it close on the timing with the cooking of the eggs, Jamal tried to take extra time. Unfortunately, he didn’t take enough extra time. So while Travis and Jason were told their eggs were runny, they were also told their eggs were runny first. This meant that they could go back and cook the eggs properly, first. What wasn’t clear to me was whether the teams could cook a surplus of eggs and then check doneness. I’m guessing that since the teams didn’t check for doneness, they were not allowed to do this. On the second try, Jamal got his eggs cooked, but the Afghanimals found themselves in 3rd place. Upon learning about the detour choices, they figured to take the higher risk option that provided the higher reward, and dress up as tea pickers and search for shears in a large and beautiful field of tea. Alas, the Afghanimals started poorly and got worse. They first interpreted a white flag as one piece of a pair of shears. This was so incorrect, it explains why they weren’t able to find the shears more quickly. They had no idea what they were looking for, and perhaps since they felt rushed, they were not systematic in their approach. After approximately two hours, they gave up and went to the bride make-up painting detour. Upon seeing that they’d have to shave their beards (clearly the TAR Producers were hoping the “Beardoes”, Brandon and Adam would face this choice), the Afghanimals balked and went back to searching the field of tea. So while Joyce from Season 7 was willing to shave her head to get the million dollars (which she did ultimately get), these guys weren’t willing to shave their beards. They eventually found their shears, but this wasn’t enough, and they finished in 4th place. First to worst. Fortunately for the Afghanimals, this was a non-elimination leg, and they get to make it to the 11th leg. 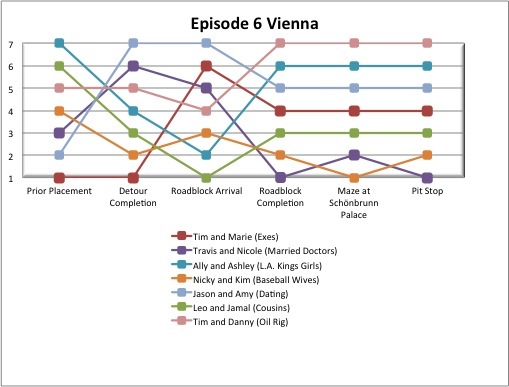 This was the second straight leg where the ER Doctors Travis and Nicole started to appear less strong than the other teams, specifically their main rivals, Jason and Amy. Travis made one mistake by trying to cut the cooking of eggs short. If he had been cautious and spent 5 more minutes cooking his eggs, this would have given him a 30 minute lead over the other teams. So while Nicole struggled the prior episode in the Road Block, Travis did the same this week. It was a much more low-key struggle, but a mistake nonetheless. They chose the bride-make up Detour choice, and were the slowest of the teams who chose to perform this task. Tim and Marie completed it probably about 30 minutes faster. If it’s any consolation, Travis looked fabulous with a clean shaven face, the make up did make his drag queen look a highlight of the episode. He would have benefitted even more if Nicole was a better makeup artist. Rock that look, Travis! Finally, it came down to a taxi-race and then a footrace between the doctors and Tim and Marie, the Exes. The ER Doctors lost the footrace, and finished in 3rd place. This is their second consecutive lower-tier finish, so they should no longer be considered a lock to win it all. The episode begins for the Exes with a major error in getting to the snake-eating task. They went to the wrong entrance of the park, and started wandering around, looking despondent. Marie was able to identify that what they were doing was wrong, but didn’t have many ideas for how to fix the situation. She wandered around in the same confused manner as Tim. They eventually left the park and found the correct entrance. They probably lost about 30 minutes with this error. Things did not improve for Marie, as she was asked to eat snake, and all of the racers knew that she’s a very, very picky eater, so it was played up in the edits such that she would not eat the food. This was iterated by both Tim and Marie herself. However, she is also a very competitive person, and sat down and ate the food without much incident. At the Road Block, we got to learn more details about Marie: While she may be very picky about what she eats, she does not necessarily cook for herself, or cook for herself well, and had no idea how to boil an egg. Additionally, we learned that she overcooks the things she does cook. However, it was not divulged what kinds of things she overcooks and turns the un-named food, per Tim, into “hockey pucks.” We learned last week that she considers herself right 99% of the time – but suddenly she seemed to have a distinct lack of knowledge on the simple subject of cooking an egg. Nice job, TAR Producers, at quickly humbling Marie. Tim, as he waited for Marie, worried that she would not even dip the eggs into the water to boil them, Tim also wondered that perhaps she would overcook the eggs, since she overcooks other food. It seems that Tim is quite aware of Marie’s personal foibles, and can actually predict how they will manifest. Indeed, an edit showed that she was not even dipping the eggs in the water. However, she did start to dip the eggs in, and she apparently dipped them in for a substantial amount of time, so she finished the challenge on the first try. Her tendency to overcook won out. Tim’s worries and hopes were both realized. Getting it right the first time saved her team about 30 minutes, and Tim was pleased. We also learn that, while Marie likes to put a little pink in her hair, she doesn’t wear makeup. However, she and Tim did a good job in putting on their Indonesian bride faces, and made up the lost time, getting them into a heated taxi and footrace they eventually won. 2nd place. Outside of the first leg, this is actually their best performance in a non-Express Pass leg. Jason and Amy have five second place finishes, and have the second best overall average score. But they have never finished first, as have the three other teams. Today would be their day. They ate the snake without incident, and, while Jason made the same mistake as Travis in undercooking his eggs, he didn’t lose any time relative to the top three teams. So it came down to putting on makeup. Amy is clearly good at putting on makeup, and her own makeup wasn’t too far off from what the final product was to look like. She could easily apply to Jason the Indonesian bride look, and they finished the Detour breezily. Overall, it was a competent leg for the dating couple, with no logistic errors and limited task errors or actual high performance on the tasks. A well-deserved first place finish, and one that should give them the confidence that they can win it all. Going into the finale, all the teams are very strong. The two “worst” teams have a pretty good finish average. As a point of comparison, the prior season’s teams (TAR 22 teams) in the final four had finish averages of 2.6, 4.6, 4.9, and 4.9. That adds up to 17, while the TAR 23 teams adds up to 13.3. So the competition is going to be very tough in the finale. These are teams that rarely make mistakes, so in order to win, the teams will have to out-perform the others, rather than hope others make mistakes. Good luck! Another exciting episode of The Amazing Race! This week, the teams traveled from Poland to Vienna, Austria. I always like it when The Amazing Race goes to a place I’ve traveled to, and for the first time this season, the teams did this. I’ve even been to the Opera House (where I saw a show from the standing room only seats) and the Schönbrunn Palace, which is as beautiful as it looks on TV! Vienna is a very nice place to visit, and I remember the coffee being served in elaborate tall mugs with lots of whipped cream. At the beginning of the episode, all the teams were eventually bunched on the train to Vienna, although, Leo and Jamal and Ally and Ashley (sporting some pretty mean-looking shades) caught up during a stop-over that required a 4 ½ hour wait for the train to Vienna. Once the teams arrived in Vienna at the Opera House, they had the option for a Fast Forward. Both Jason and Amy and Travis and Nicole decided to go for it, but Travis and Nicole didn’t like the idea of having to take the risk that the other team would get there first, so they bailed on this idea and went to the Detour. Jason and Amy persevered, and went to the top of the tower where they were to bungee jump, but high winds prevented a safe jump. They argued a little, but when the weather didn’t seem to be changing, they found themselves suddenly behind all the other teams. Arguments over, and focus at finishing the tasks at had ensued. Nice work getting through the adversity, Jason and Amy! All teams chose the “Masquerade” detour, and it did not appear difficult, as all teams breezed through it. In looking at the Tracker, you can see that the Exes, Tim and Marie finished the Detour first, but then had trouble finding a taxi, pushing them toward the bottom of the pack. This taxi-trouble will come into play later. The real challenge was the Road Block, where a team member was required to sing a Shubert piece in German with the boy’s choir. It appeared that the choirmaster doing the judging was holding the racers to a high standard (but probably became more lax as time passed), so this was a long process, and took up most of the episode. Us viewers benefit by really getting to know that Schubert melody along with some German pronunciation lessons. While Travis and Nicole lagged at the beginning of the leg, Travis was the most experienced singer of those doing the Road Block, and he finished quickly, although the lessons looked like they were pretty in-depth, and it probably took at least an hour before the first attempt. The non-Road-Block-performing racers were certainly tense as they had to wait this out, and Nicole jumped up in glee when Travis met the standard of the choirmaster. But Nicky wasn’t far behind. When Nicky and Kim went outside, they approached a cab, whose driver promptly took Jason and Amy’s bags out of the trunk. Apparently, based on the comments of the racers, there is a rule where players are not allowed to take another team’s bags out of the taxi. Or, I’m supposing, they’re not allowed to touch other teams’ bags, period. However, the taxi driver, not specifically prompted, took out Jason and Amy’s bags, and put them on the ground. Nicky and Kim had a funny feeling about all of this, and decided to not mess with the situation, and found their own cab. It should be noted that, had they taken Jason and Amy’s cab, they might have come in first, because it was very close at the finish line! But it was Travis and Nicole on top, making it their second victory, and continuing their streak of being in the top tier of teams each week. And they hold the Express Pass. Talk about being in control of the race! Leo and Jamal, who thankfully were not shown referring to any of their other contestants as their wives this week, came in 3rd, based on the strength of Jamal’s unabashed singing style. In fourth were the now Express Pass-less Tim and Marie. Tim did a fine job of convincing the choirmaster that he could sing Schubert. Now they just needed to find a taxi. While some teams had their taxis stay, for some reason Tim and Marie didn’t have one waiting, and they were already burned earlier in the episode for having trouble finding a taxi. Marie did add her usual, uh, flair, by promptly taking the cab that was obviously Jason and Amy’s. She was happy to note that she didn’t touch the bags, and that she would attempt to pin this cab-stealing to Leo and Jamal. The cab driver, for his part, thought he was taking Jason and Amy, and Marie assured him that it was OK, showing him the blue “Route Info” clue and saying they’re all on the same “blue” team. This was, indeed, clever, and it’s clear that one of Marie’s, uh, strengths, is perpetuating a web of lies. Jason and Amy did a good job of fighting back from their weather-related bad luck at the Fast Forward, were not far behind Tim and Marie in finishing the Road Block in solid 5th place. They were not pleased about having to find a new cab, however. Upon arriving at the castle, Jason saw their old cab, noted that Tim and Marie’s bags were in it now, and immediately smelled a rat. This set up an argument at the Pit Stop Mat where the two teams bickered about the ethics of cab stealing, with Jason and Amy having the moral high ground, as they did not steal any teams’ cabs that leg, even when presented the opportunity. It should be noted that Tim and Marie did not incur a penalty or break any rules, and cab-stealing is a somewhat common occurrence, albeit, usually at the point of obtaining a cab. Additionally, Jason and Amy caught a bad break by having a cab driver who messed with their bags and created the opportunity for “clean” cab stealing. The net effect is that these two teams who worked well with each other in prior episodes are now enemies. And that the greeter who stood next to Phil certainly believes Americans to be boorish and argumentative. Her many winces at the hurling insults between the two teams were wonderfully captured. Oh, at the bottom of the pack were Oklahoma Oilmen Tim and Danny and Ally and Ashley. Tim and Danny’s performance have been merely middling (they’ve place in 9th, 6th, 4th, 6th, and 5th), while Ally and Ashley are riding four consecutive 7th place finishes. Ally came through with the singing, while Tim struggled the most of all contestants. The LA Kings Ice Girls snuck away with the 6th place finish, while Tim and Danny didn’t get that million dollars that they need, but at least have the memories of a lifetime, like polka dancing in beautiful costumes. So the question remains as this season plays out: When, exactly, will Tim and Marie implode? Judging from the scenes from next week, it could be coming up rather quickly!